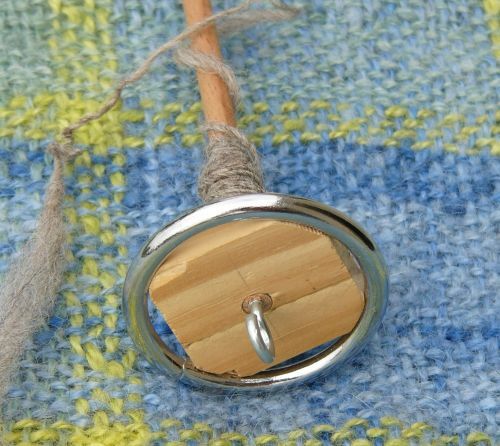 Building a handspindle can be as simple or sophisticated as you want to make it. I'm not a woodworker - I only know about the simple ways! Basically, everything that's round and flat wants to be a whorl, and everything that's dowel-shaped (like knitting needles) wants to be a spindle shaft! Disclaimer: I have made a number of spindles and other equipment without drilling holes in my thighs or cutting off any fingers. But you need to take the necessary precautions yourself - I will not be held responsible for any accidents! Bottom-whorl spindles are more tolerant of mistakes then top-whorl spindles because they rotate slower. 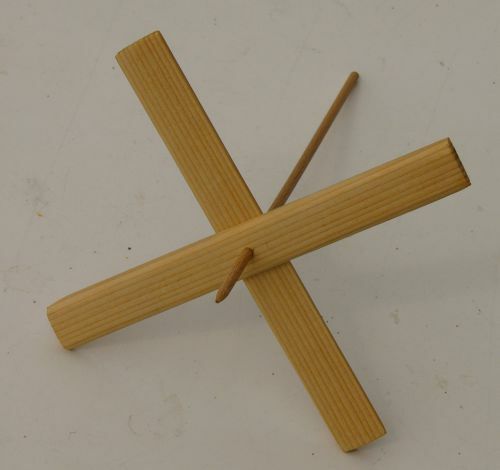 My first spindle was a circle of wood on a piece of dowel. Making one of those only makes sense if you already have at least one piece of wood some 5 inches square (or big enough for the whorl you have in mind) and 1/4 to 1/2 inch thick. The dowels you may have to buy - get some more, and in different diameters. Pick out straight ones! Drill a hole in the middle of the circle (about as big as your dowel or a tiny little bit smaller - that's the best you can do as drills come in standard sizes and cheap dowels from the hardware store have quite large tolerances). Grind one end of the dowel to a tip - or use a pencil sharpener. Push the whorl onto the shaft. Maybe you'll need to grind the dowel down a bit. Or use a bit of glue to fasten the whorl. Screw a hook into the other end of the dowel - or cut a notch about one inch from the top. In the latter case you need to fasten the yarn with a half-hitch. That's the principle. All decoration is optional. 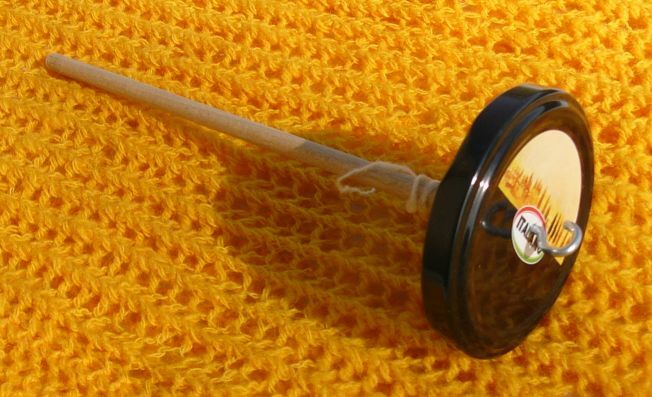 But first, try how the spindle spins - don't waste time on one that wobbles too much. That happens if you haven't hit the center of the circle, or if the hole is not straight, or if the circle is irregular. In that case, you may try to remedy the problem, or just start again. 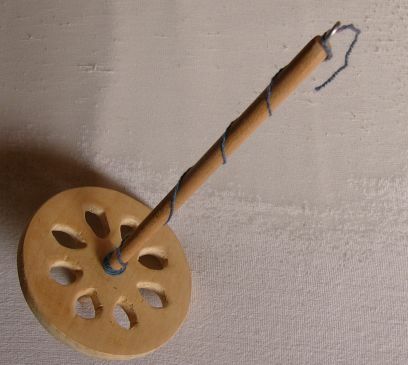 This is a later attempt at a wooden-disk spindle. I drilled some holes into the disk to reduce weight and get the weight more to the outside of the whorl. No, the disk is not particularly beautiful - but I told you I'm not a woodworker, didn't I? 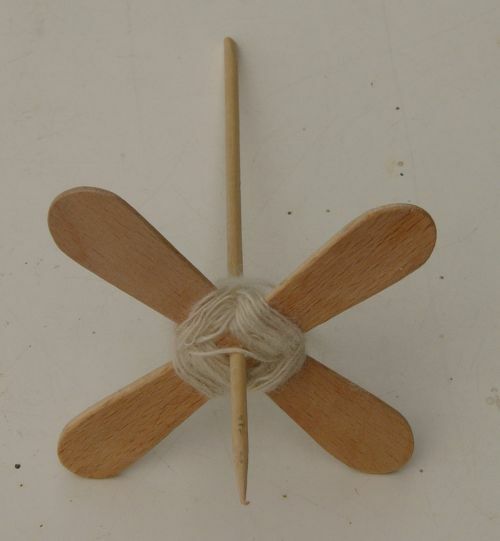 If you can find wooden toy wheels in your hardware store, they will simplify the process. You can fasten a CD to a dowel by means of a rubber gasket ring from the plumbing section of your hardware store (or by any other means you can think of). I have made one or two CD spindles, but I'm not satisfied by the way they spin - I think they are too sluggish. This is my version of the turkish spindle. It's dead easy to make and you can take it apart to get a center-pull ball. I think the pictures are self-explanatory: Cut off two pieces of wood, drill a hole in the middle (a tiny itsy bit smaller than the dowel), push the dowel through the hole - finished! Do NOT glue the dowel to the cross pieces! You can also make a very light-weight version with a shesh kabob skewer and two sticks from icecream lollies (popsicles). You wind the spun yarn around the crossed arms. When you are finished, you pull the dowel out of the arms and the arms out of the ball. They are more difficult to make than bottom-whorl spindles. Because they spin much faster, any imbalance will be much more noticeable. I only succeeded in making one top-whorl spindle that worked well. The construction is based on Tom Golding's design (but his spindles spin much better and are much more beautiful!). I used a metal ring from the hardware store. The difficulty is fastening the ring to the dowel - I used wood to bridge the gap. But getting the wood stuck in the ring, and then finding the center of the ring, and drilling a straight hole - all that is so much work that it may be more economic to buy a top-whorl spindle. At least if you don't have to pay a fortune in shipping cost! Make a tiny hole in the center of the lid (I pierced it with the tip of a nail), pre-drill a small hole in the dowel, screw the cup hook through the lid into the dowel till the assembly is pretty solid. Finished! This spindle weighs 12 g. This is the weight of a Briar Rose, but my whorl is larger. Therefore the spindle spins slower, but for a nice long time. You need to take more care when rolling it on your thigh than with the bought spindles I have - the risk of wobbling is bigger. But I did manage to spin some laceweight on it without problem. The spindle is not perfect - but very good value for money and time! Disclaimer: I will not be held responsible for any weight gain resulting from emptying all available jars to get hold of the lids!